Looking at graphic photos of starving Somalis or reading about the perils of drought in East Africa, one might conclude that there is not enough food grown there, or not enough capacity to produce food. But many who work on the ground in sub-Saharan Africa would argue that the problem of food security in that region is historically tied to poorly -planned colonial agricultural systems as well as misdirected aid programs in the 1980s and 1990s. One social entrepreneur, Rachel Zedeck, built on years of experience in international development work to create a program that addresses agricultural underdevelopment at the Bottom of the Pyramid. Her organization, Backpack Farm, supports farmers’ growth through innovative products and low-cost trainings that foster entrepreneurship and educate farmers about sustainable production techniques. RS: How did you come to found this organization? Zedeck: I’m passionate about food security. Drought happens every year in this region. Every year there’s a famine. Every year there’s economic loss. This year is particularly bad but it’s not new. I started this project in south Sudan. It’s like Somalia is a poster child for the aid world now. We created our program with a fraction of the money being pledged in aid. The real problems are systemic and that’s where solutions need to emerge. We have food surplus in Nakuru, an area four hour drive from the drought area, and we can’t get there because of the roads. This is a systemic problem. We have to start addressing drought with a system program for change – you cannot put a Band-Aid on drought, it won’t work. We have water – there’s an abundant amount of rain during the rainy season – but we don’t collect it. We act like drought is a shocking occurrence. All of the countries we see in conflict now are on the list of top 23 food-importing countries. At some point, there is a correlation between food security and human conflict. What are the core elements of Backpack Farms? We are providing farmers with access to packages of green agro-tech [backpacks – hence the name of the organization] and training. That is our primary mission. We don’t give the classes away for free – they are about a dollar for a full day of extensive training on bed-raising, composting, water management, and so on. We do give away manuals with designs for better farming techniques. Also, we are launching our KUZA doctor program, which is providing information about managing crops through mobile phones in a cost-effective way. It’s a great tool, in collaboration with Mercy Corps that uses SMS to provide information to smallholder farms in English and Swahili. And we are collaborating with Scientific Animators Without Borders to produce short training films. What defines a small holder farm? We look at what’s called the mid-stratum of farmers: 2 to 5 acres, earn their primary income from farming, were raised on a farm, have the desire to farm, want to learn how to be a better farmer, want to use better technology and are willing to do training and invest in products. Somalis, by the way, are pastoralists and they don’t farm, though they are willing to learn. The aid world has focused a lot on what’s called the last-mile farmer –they are growing for food security, not doing very well overall. But that’s not a smallholder farmer, that’s subsistence farming. The government agricultural programs are not thinking about farming in the right way – composting, organic. Our farms are 85 percent organic. 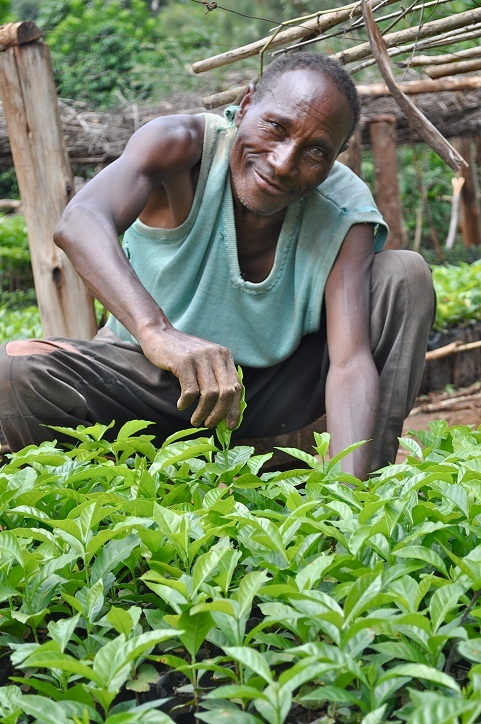 So how did your vision to help smallholder farms come to life? Four years ago the world laughed in my face about smallholder farmers. The head of every major agency they laughed at me, said oh this won’t work, you’re a dreamer, you’re an idealist. But I’m not. I just saw that they are the largest untapped economic resource in sub-Saharan Africa – 80 to 100 million of them, and no one works with them. Then I did a presentation for Mercy Corps, a wonderful organization, and we began a partnership. We haven’t taken one cent of donor finance. I’m self-funded. We focus on primary production – the average African farmer is only utilizing 15 to 20 percent of their production capacity. The British, when they were in power, made maize their colonial crop and they exported it from East Africa back to Britain. They were able to get farmers to grow maize, a non-indigenous crop – it’s extremely hard on soil – with a massive marketing campaign. Now as a result, year after year these farmers grew fewer crops and don’t have the resources to ask what to do. How do you assess the impact of your programs? We estimate that we’ve trained about 13,000 farmers in Kenya. Every time we visit a farm and talk to farmers, the leader grabs me and hugs me, and says thank you. These are full-time schools open to the community, and franchise managers and farmers understand that we will train people who can’t afford it. We would like them to pay 20 to 40 shillings a class but if they can’t do that, we will train them. There is an immense gratitude from these people. And the program is self-sustaining. We have amazing franchises that we have organized with existing farming organizations that we have trained and provided with marketing materials, and they are doing our training programs under our supervision. They earn income by selling products through us – the backpacks. We get weekly and monthly progress reports from them. What is one of the biggest challenges in your work and how are you getting around it? Finance. I don’t have the money to grow. But we are making it anyway. Later on with finance we will expand into Uganda and Tanzania. One of our program challenges is distribution costs – for our farmers to sell these very heavy irrigation units in the backpacks, it can be very difficult. I’d love feedback on what we’re doing. Also we want to incubate competition. There needs to be ten more of us.